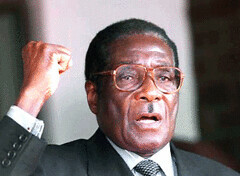 No African leader can survive without white support! Travel around the campus, the conversations is about Mugabe who tried it and failed. So what more can we say about African leaders? Is the problem with African leaders? I don’t think so, firstly African leaders are just the same as Western leaders? So why African leaders can’t survive without white support? The answer is obvious, African countries can’t produce enough food to feed themselves, as a result you can’t bite the hand that feeds you. Allow me to say that Africans do not produce their own food as a consequence they rely at the kindness of rich and powerful countries. In Zimbabwe the problem is with Mugabe who wants to be independent, which is highly unlikely, because his black farmers are not producing anything. For the sake of African’s rights for survival, African leaders must remain dependent to rich countries, because independence is costly. Transformation in our minds only! The political environment of South Africa has improved, but economic apartheid and separation in our minds still exists. I’ve been in Grahamstown for a long time now and the economic apartheid and divisions still exist in a lot of people’s minds. I’m trying to say that the consequences of apartheid along racial lines are still in place today. Some people might disagree with me, because I don’t have statistical evidence with me and accuse me of generalisations. But my experience in Grahamstown says it all. My point is that the attitude between students is different towards each other, not all of them of course. But, mostly Blacks from remote areas socialise along their lines and their attitude towards middle class people whether white or black is more or less the same. For instance, if you eat in dining halls this is no strange to you. There are whites, Zimbabwean and black South African dominated tables. Besides the socialising point, we greet each other along racial lines, for example, when a black person meet a white person, it’s that hi greeting for the sake, but when he meets a fellow black person the greeting is different. Look at places like Friars Tucks it’s dominated by rich English first language speakers and you can only find few African middle class elite. Put the issue of money aside, if you go there as a black person you will really feel lost. Grahamstown has two market black markets and white market, for example, Shoprite is dominated by blacks and Pick ‘n Pay dominated by white and few black middle class people. Township is seen as a place of entertainment by tourists just because is different from town. For example, rich white people visit townships as it is a game reserve!